← A Few Pics From the Art Show…..
Well, although it is 10:30 on a Thursday night, I still wanted to squeeze my Throwback Thursday post in since we missed it last Thursday due to the 4th of July holiday, and then the week prior I was busy getting ready for the art show. So having said that, I owe you all one! And yes, feel free to take another gander – that is indeed colored with Crayola markers and crayons! 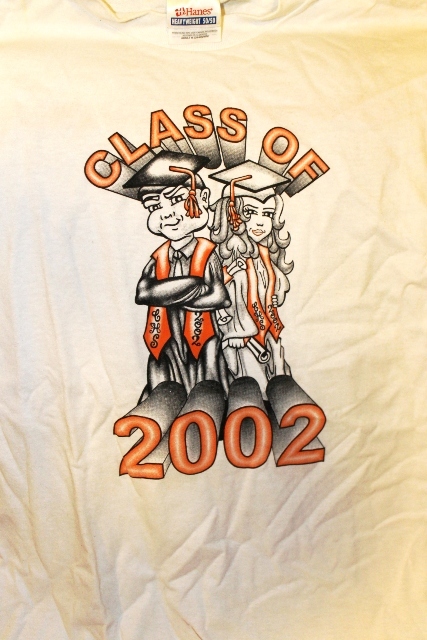 Only the BEST for my class of 2002! Doesn’t get much more professional than that! Anyhow, long story short, I WON! Woo hoo! And yes, I STILL have the shirt! lol. 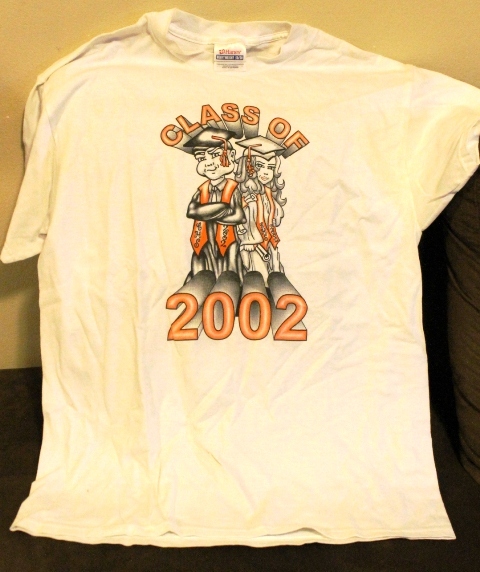 Excuse the “wrinkledness” – it has been sitting in a box for the past 11 years. And on the back was an entire list of all the names of each and every high school senior at our school. And the funny thing is – I didn’t even know I won until one of my friends who had pre-ordered the shirt came running up to me to tell me that my design had won! And the even funnier thing is that instead of being extremely happy, I was so mad that they had changed my design – they chopped off their little feet and taken away some of the original colors! – I was so concerned with the fact that it wasn’t showing my “best” work, at the time. (Yes, I’m over it now. Although, now that I think about it, I still don’t like to publicly show anything unless I consider it my “best” work. ) And then the funniest part was after my friend had informed me I had won the contest, I walked all the way to the “student body presidency meeting area” to claim my free t-shirt, and the adult supervisor didn’t even remember me or remember the fact that she promised me a free t-shirt! So I had to convince her that she did, in fact, promise the winner a free t-shirt – She eventually, reluctantly agreed. Ohhhhh – I laugh about it now! Nonetheless, I am proud of my shirt and always will be! Go seniors! Anyhow, I hope you enjoyed my little blast from the past for this week! If you would like to participate in Throwback Thursday, just send me an email via the “Contact Me” tab above and click on the “General Questions or Comments” and make sure to include the title “Throwback Thursday” in your request. Then I’ll get back to you asap with an email that you can send your picture into. NOTE: You DO NOT need to be “an artist”of any kind to participate. To participate, all you’ll need is a photo of your art project/painting/sculpture/drawing (etc) and a small blurb describing your photo including your age/grade when you created your work of art. If you would like, you can also include any current artwork (if any) or a current website. And if you want to be even more daring – you can even include your current age! ::gasp::! It’s all in good fun! 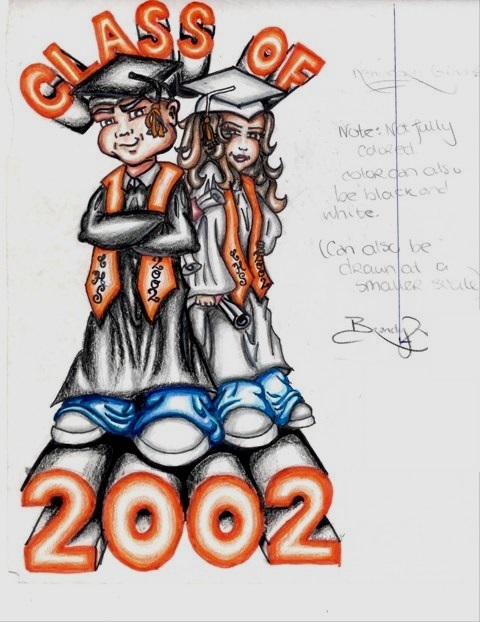 This entry was posted in Uncategorized and tagged 2002, design, drawing, logo, seniors, t-shirt, throwback thursday. Bookmark the permalink. One Response to Throwback Thursday! – An Ode to the Artistic Past!